INS Viraat, the world's oldest aircraft carrier, was accorded a grand send-off from Kochi,the port city on Sunday, after over five decades of its service to the Navy. The ship, which underwent a decommissioning refit, is being towed back by three tugs to Mumbai for the decommissioning ceremony. 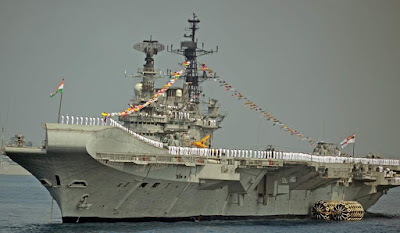 The final journey of the carrier began with Navy officials led by the Chief of Staff, Southern Naval Command, Rear Admiral Nadkarni bidding farewell to the carrier at Ernakulam Wharf of Cochin Port Trust this morning. Viraat is expected to be decommissioned by end of this year, after 55 years of service, including 27 years with the Royal Navy (British Navy). The Navy has agreed to hand over INS Viraat to Andhra Pradesh government after its decommissioning. The AP government had shown a keen interest in getting INS Viraat, the oldest aircraft carrier operated by Indian Navy, to berth in Vizag for promotion of tourism after its decommissioning.